Indianapolis Matinee Musicale offers rich experiences for music lovers of all ages. We sponsor performance opportunities and scholarship competitions for students, as well as professional recitals and choral concerts. Memberships are in four categories: Active/Professional Members are performers and teachers of classical music who hold college degrees in those areas or the equivalent professional musical experience. They may perform on the Active Members recitals. Associate Members joint to support the Active Members and students, but do not perform. They may offer this support by paying dues, attending recitals, donating money for scholarships, and food for receptions. A third way to be a part of IMM is to be a member of the Choral Ensemble. The Junior Section of IMM is for elementary through eighth grade performers, and the Student Section is for ninth through twelfth graders. 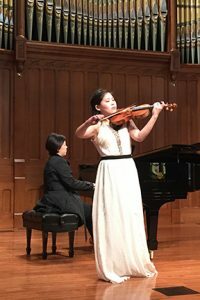 Young musicians in these age brackets pay a small fee to obtain a one-year Student Membership which enables them to perform on one recital and participate in the Junior/Student Scholarship Auditions in May. Teachers who are Active/Professional members may place their students in our Junior/Student recitals and the yearly scholarship competition. Our events are open to the public at no charge. The Collegiate Scholarship Competition is open to full time music students, undergraduate, graduate, and artist diploma, in the state of Indiana. Our Young Artist Recital features scholarship winners. The Choral Ensemble is an SSA women’s choir. Membership is by audition with the Choral Director, Diana Stanton. We welcome your interest in IMM. We invite you to participate in our vibrant contributions to the music community in the Indianapolis area.